Price Improved to Live in Style! Sleek, Modern Aesthetic in this spectacular, south facing 2 bedroom, 2 bath Penthouse condo! 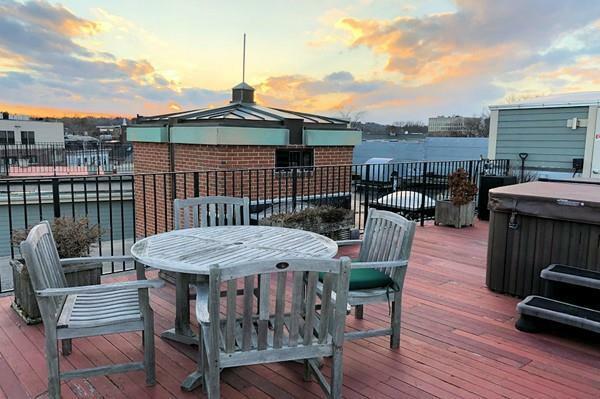 Complete with a tandem (2) Garage space and Huge private Roof Deck with hot tub.. Relax and enjoy the View! Entertain your friends in the Poggen Pohl kitchen with soap stone/stainless steel counter tops, Sub-zero refrigerator, Gaggenau gas cook top & wall oven, Miele dishwasher, plus bar that just flows into the open living area. Flooded with sunlight all day, this corner condo features dramatic angles, gallery walls, light wood floors, central air (2017), radiant heating (fully upgraded 2016), unique double bath with tub and steam shower, in-unit Bosch washer/dryer (2018), king-sized Master. Pets require trustee approval. Elevator building is professionally managed, Pierce elementary. All of this in the Heart of Brookline Village just 1 block to the T & moments from everything City Living has to offer! Seller now paying $10, 000 towards assessment!